There are many explanations for the fall-off in trading, from software- to news-related. What’s less understood is why the level hasn’t recovered as Bitcoin’s price made a 50 percent comeback since Feb. 5. That’s left some investors wondering whether the cryptocurrency is waning in popularity. The transaction data may be bad news for Bitcoin bulls, according to Charles Morris, chief investment officer of Newscape Capital Group in London, who invests in cryptocurrencies. Trading and purchases on the Bitcoin network, which can be measured by metrics like transaction volume, is indicative of price direction, he said. Average transaction confirmation times have tumbled — though that may be in part because the technology that underlies Bitcoin has already been adapted to address some of these delays. For example, a software enhancement known as the SegWit protocol, changing the way data is stored on the blockchain, was activated last week by Coinbase Inc., the largest U.S. cryptocurrency exchange. Not everyone agrees that lower volumes signal trouble for Bitcoin. It may be a healthy return to normality and signs that the market is maturing. 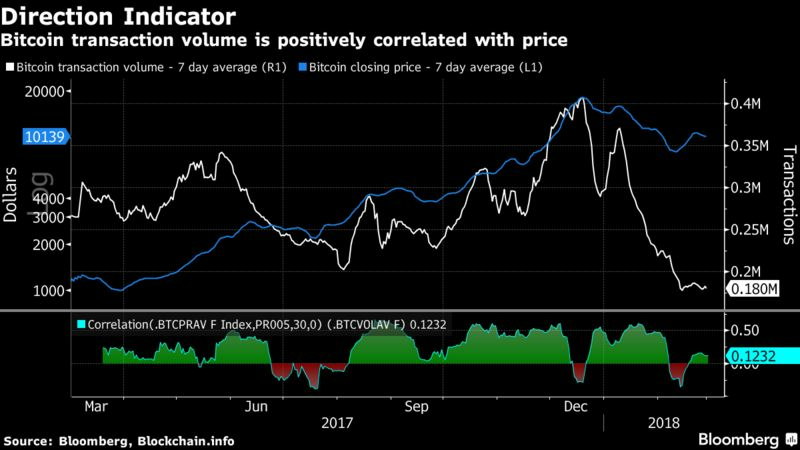 Should prices start rallying again, traders may well be coaxed back, according to David Drake, whose New York-based family office has more than $10 million in cryptocurrency and blockchain investments. He sees the currency soaring to $35,000 by the end of the year. The decline in prices may itself be to blame for lower trading volumes in Bitcoin. And websites that once only allowed payment in Bitcoin now accept a much wider range of digital currencies, according to Kyle Samani, managing partner at crypto hedge fund Multicoin Capital. That makes alternative currencies more appealing than the first-mover in the space. A year ago, bitcoin’s market capitalization was about 85 percent of the total sector. It’s now around 40 percent, according to website Coinmarketcap.com.